Iwachu located in Morioka, Japan with over a 100 years of history and experience is one of the finest manufacturers of modern Nanbu ironware. Craftsmen at Iwachu pay respect to this tradition by infusing each Iwachu product with precision handcraftsmanship throughout the manufacturing process. 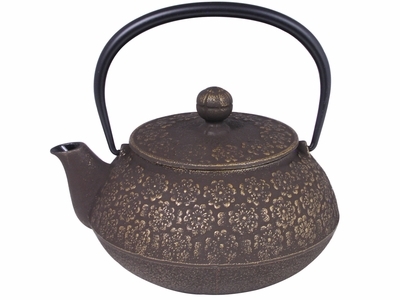 Iwachu's tetsubin cast iron tea pots have earned a well deserved worldwide reputation for superior quality, beauty, and durability. The production process of making tetsubin cast ironware usually consists of 64 to 68 steps. At Iwachu, most of this is still done by hand and quality is strictly maintained and controlled by master craftsmen known as �Kamashi�. It requires at least 15 years of apprenticehood to become a full-fledged craftsman and 30~40 years to become a �Kamashi�. We at MrsLinsKitchen.com are proud to share such a fine teaware from Japan. We hope you will enjoy the quality of this teaware just as much as we do.